One of the most challenging aspects of the American Political System? It is impossible to accurately represent the full, informed spectrum of political thought. It is often a vapid concoction offering the most drab philosophies of government, while constantly osmosizing and proselytizing the bright, energetic colors from its edge. But diluted in this process are not only those purest strands of color, but also the many subtle transitions which serve to form our most common bonds. In true representation, the Liberal and Libertarian are more alike than their overlord party caricatures would suggest. The belief in good, efficient government to ensure equality and liberty (Liberals) is not mutually exclusive to the belief in liberty achieved via personal freedom and responsibility (Libertarians). 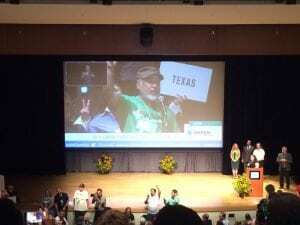 After so much exposure to the center, it was quite the experience to witness a leading edge of this challenging system at the 2016 Green Party National Convention. Infused with new energy, membership and purpose, Convention delegates handily selected environmental health advocate and Progressive activist Dr. Jill Stein as their Nominee for President of the United States. Stein also selected Ajamu Baraka as her running mate on the ticket. In her fiery acceptance speech, Stein took immediate aim at the major parties. 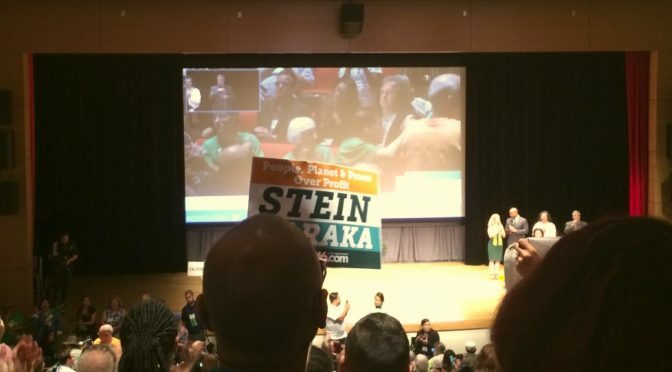 “We are what Democracy looks like, and we are what political revolution looks like” Stein declares in a direct nod to the Bernie Sanders campaign and the many disaffected Sanders supporters whom have lifted the Green Party to heights unseen in decades. The most popular slogan for the Convention? ‘Jill Not Hill’. But how can Stein and Baraka reach such a coveted status as ‘the greater good’ when they’ve to even garner a place on the majority of state ballots? This and other questions were of utmost importance in a Post-Convention Press Conference, where the candidates had to trade their expansive rhetoric for a bit of reality. Even if the Presidency is out of the party’s reach in 2016, other goals were revealed. Since the Democratic National Convention where Bernie Sanders conceded to Hillary Clinton, the Green Party has received ‘a whirlwind of support’, fundraising more in the last few weeks than the entire previous year of the campaign, and tripling standing in the national polls. Lee McQueen of McQueen Press posted the full Press Conference, where I was able to ask the candidate an important question that many voters considering the Green Party would want to know. Assuming they could win the White House, how would President Stein and Vice President Baraka actually govern?? Texas Leftist: With the Progressive, aggressive agenda that you have laid out, how do you expect to get those initiatives through a predominantly Democratic and/or Republican Congress? In other words, governing isn’t something they need to consider at the moment. And herein lies the difficulty with support of a minor party. Without concrete plans of how to act on such an inspiring agenda, little can be accomplished in the real houses of government. For all of their faults, it is the major parties that retain the ability of turning words into actions. Though likely that they will fall short, most Americans would still rather see some progress achieved than simply promises that never have a credible chance. At the end of the day, the Green Party harbors a strong and important set of ideas. Their goal of a Green Presidency is still a long way from Houston, and 2016. But the outcome of one Presidential contest should not be the judge of an entire movement. Greens are already winning important state and local races across the country, and this election cycle could prove their most successful yet. The Green Party of Texas is fielding over 40 candidates for office across the state, including Martina Salinas for Texas Railroad Commissioner. From a host of campaign appearances to an informed debate with her Libertarian Party challenger Mark Miller, Salinas could be one to watch this November. In an election year already full of surprises, the Green Party is getting ready for their big moment just in case it should occur. Visit the National Green Party website for information on candidates in your area. You can also hear more from Dr. Jill Stein at a CNN Town Hall Telecast, set to air internationally on August 17th. The Green Party of Texas casts its votes for the Presidential Nominee. 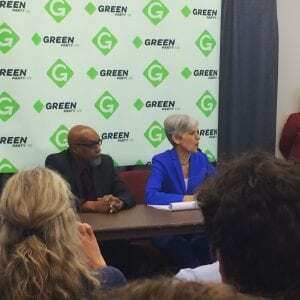 Dr. Jill Stein and Ajamu Baraka at the Post-Convention Press Conference.